View of the newly protected property in the Black Creek CorridorRobert Rodriguez, Jr. Our acquisition of a conservation easement on this property protects 1,800 feet of Black Creek shoreline, safeguarding scenic views along a stream popular for kayaking and fishing. 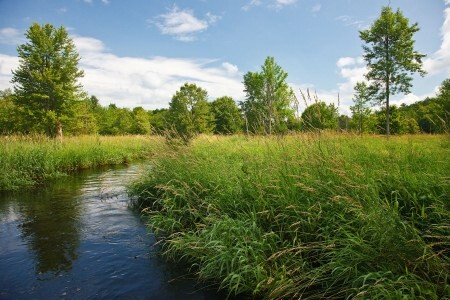 It also guarantees permanent preservation of an extensive wetlands complex whose ecological significance is recognized by its inclusion in two state-designated Biologically Important Areas. Public access will be allowed on a portion of land along the creek, providing a place for paddlers to stop and rest. In addition to preserving important wildlife habitat, protected wetlands will mitigate ecological and property damage from sea-level rises and storm surges under predicted climate-change scenarios. The purchase is part of Scenic Hudson’s collaborative campaign to Save the Land That Matters Most, protecting 65,000 acres of great scenic, ecological and agricultural significance.